"At the end of the day, this is going to be normal," declares Josef (Mark Duplass), embracing Aaron (Patrick Brice), whom he has only just met, with a clingy firmness. "This isn't weird at all." In response to an ad on Craigslist, amateur videographer and all-round nice guy Aaron has driven up to Josef's woodland home, armed only with his digicam. Expressly invoking the Michael Keaton-starring terminal illness weepie My Life (1993), Josef explains that, owing to a brain tumour which will kill him within months, he wants, with Aaron's help, to make a posthumous video diary for his as yet unborn son Buddy. Everything that we see here is the result of this arrangement, shot on Aaron's camera, as these two strangers set off together to record who Josef really is and what he is like. Right from the get-go, there is something not quite right about Josef, something that seems to go beyond the "cognitive misfiring" that he openly associates with his medical condition. Maybe it is his initial insistence on being filmed naked enjoying "tubby time" in the bath ("it's ok," he unconvincingly reassures Aaron, "we're going to go to much deeper places than this"). Or maybe it's his habit of sneaking up on Aaron and scaring the life out of him. Or maybe it is the cheap wolf mask on which he has lavished a memorably bizarre name and even a theme song - or the increasingly alarming anecdotes that he tells about his life. Still, if this movie for Buddy proves also to be a buddy movie, the odd couple at its centre are a genre-busting mix of amiable Bill and Ted on a bogus journey and Chuck and Buck headed down a darkly sinister path. We have a pretty good idea from the outset which one of these fellow travellers is the titular Creep, but working out exactly how and why engenders a perfect intersection of comedy and horror. Sometimes simplest is best. 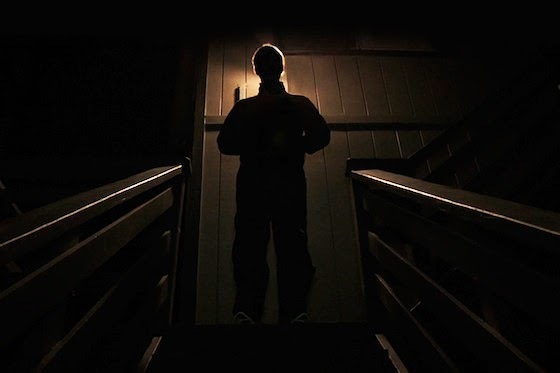 Directed by Brice and co-written by both its stars, Creep is as simple as they come: a two-hander with a one-camera setup, deriving its considerable tension not from any whizzbang effects or monstrous mayhem, but from those most basic of dramatic ingredients, character, script and performance. The precisely modulated interplay and dialogue between Aaron and Josef alert viewers very early in the picture that something is very, very wrong, and the suspense that this generates is both cruelly funny and unbearably menacing. Once Josef has started playing his crazy, creepy games, and Aaron gets unwillingly cast as the boy who cried wolf, the viewer is filled with the delirious sense that almost anything could happen - and waiting for it to do so is a constant nervy thrill. No other recent film has made me laugh - or jump - as much. 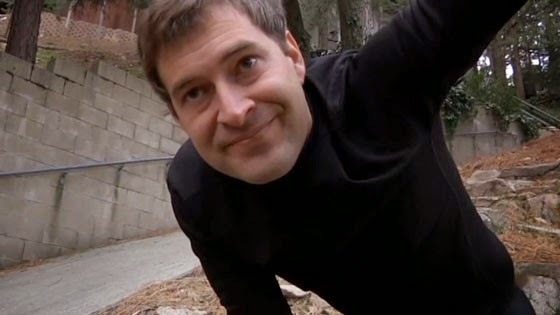 Ultimately less found than stored footage, Creep is a very fresh, hilariously mean-spirited take on both the 'first-person' format and the stalk-and-slash subgenre - and a lo-fi mumblegore treasure that any discerning, or just unhealthily obsessive, cinephile will want to add to their collection.